When you're moving into your new home, it can be easy to start dreaming about the perfect bathroom vanity, steam shower or other bathroom accessories, but your current home is your first priority! A bathroom is a place that buyers will thoroughly inspect upon entering your home, so it should be looking better than ever. According to NewburyportNews.com, cleaning out the grout and other imperfections in between your tiles should be your first goal. Use anti-mildew cleaner and remove any trace of soap scum from your grout and the surface of your bathtub. If your current vanity has seen better days, consider changing the hardware. A few new door handles and knobs can go a long way to improve the aesthetics the piece without breaking the bank. On the other hand, if your vanity is really in sorry shape, consider giving it a fresh coat of paint that can hide any imperfections. You'll soon design your dream bathroom, but it's time to freshen up the old one in the meantime. 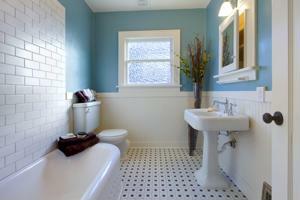 What home staging tips do you have for home sellers sprucing up their bathrooms?